For those who have not picked-up a Nepali newspaper the last few days - the finals of the PM Cup was delirious. 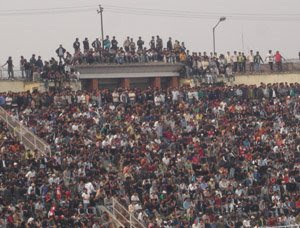 Fans were on top of roofs watching the match - chanting, jumping, doing the Mexican wave. 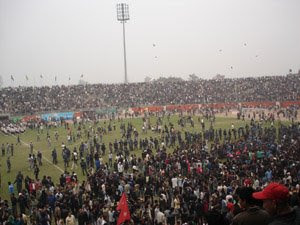 Once Nepal won the match after penalty kicks, fans rushed the field and were there for nearly an hour parading with players and officials and dancing to the tunes of the Army marching band. Without a doubt Calcutta and Nepal are the Mecca of South Asian football.